There are numerous erudite papers and consumer reviews about Albert Camus (1913-1960) and his brilliant 1942 novel The Outsider (also translated as The Stranger) so my thoughts here will be brief. If you’re not familiar with the novel, the entry at Wikipedia is comprehensive, but – be warned – the summary of the novel reveals the entire plot. I first read Camus at university. I read The Plague first and found it stunning, and then I read The Outsider. This was my first experience of French Absurdism, which Wikipedia defines as the conflict between (a) the human tendency to seek inherent value and meaning in life and (b) the human inability to find any. It was because of this book that I went on to read a bit of French existentialism including Simone de Beauvoir and a bit of Sartre, though according to the Wikipedia entry, Camus apparently always denied that he was an existentialist and was opposed to nihilism. The Philosophy Book labels Camus as an existentialist, and though they skate about a bit, so does The Oxford Companion to Philosophy and so does Frederick Copleston’s History of Philosophy (Vol 9, A History of Philosophy: v. 9: Maine de Biran to Sartre). Camus was apparently not a professional philosopher so *wry smile* perhaps he didn’t know what he was, or maybe it was because of his quarrel with Sartre that he disassociated himself from existentialism. Pity the philosophy student who has to disentangle this, eh? Fortunately for me, I just get to read and enjoy Camus’ novel without having to worry about the branch of philosophy that he belongs to. I like revisiting books that I’ve previously read when I come across them as audio books, especially when I read the book many years ago and although the impression is still vivid, the details have become a bit vague in my mind. 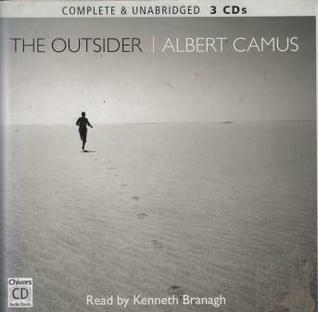 This recording by Kenneth Branagh is really very good indeed – he captures Meursault’s dry, indifferent tone to perfection, so it is all the more effective at the end where Meursault loses his equanimity and shouts at that pestering priest, who – for his own piece of mind – wants Meursalt to say that he repents. Meursault refuses to lie – as indeed throughout the novel he refuses to lie to meet the expectations of other people. A man who refuses to be what society thinks he should be and will not lie to make others feel comfortable, is estranged from society, because all of us lie at different times, if only not to hurt the feelings of others. Often we lie by remaining silent, as Meursault does with his girlfriend and with others, because there is no point in arguing or trying to explain, it’s easier just to let people think what they want because we don’t actually care about what they think. But believing that it’s a bit pointless trying to explain yourself for Hubbard’s reasons is a bit different to not caring about what others think. Even if people take this position because they believe that life is ultimately meaningless, it’s confronting for others to realise that the person they are engaged with simply doesn’t care about their opinions or reactions. Of course most of the time this tacit lying isn’t revealed, and the wheels of life run smoothly enough. What Camus does in this novel is to make Meursault’s indifference explicit. The other characters find this very confronting indeed when he doesn’t behave as expected at his mother’s funeral and won’t say ‘I love you’ to his girlfriend. Meursault is both a stranger and an outsider – both titles are apt, though I prefer The Stranger as it is closer to the French original (L’Étranger) with its connotations of ‘estrangement’. To me, ‘outsider’ implies rejection by ‘insiders’ whereas Meursault chooses his separateness. He chooses to refuse to engage with the expectations of others – even at the cost of his own defence when his life is at stake – because he believes that life is absurd, it has no meaning, and there is no God. This doesn’t make him unhappy, but for Meursault it does demand honesty. Title: The Outsider, also translated from the French L’Étranger as The Stranger. Beautiful review, Lisa! I enjoyed reading your description of how Camus is categorized by different philosophers. I also loved your comparison of the two English translations of the title. ‘The Stranger’ is definitely more appropriate. I read ‘The Stranger’ many years back and I loved it when I read it. I can’t remember details of the story now beyond the basic plot, but I remember highlighting many passages throughout the book. I should take out the book and read it again. Gosh, Vishy, how would anyone pronounce Camus’s with that extra ‘s’? It would sound like Camoozizzes! But if you can get this audio book from the library, it’s from the BBC after all, I’m sure you’d love Kenneth Branagh’s narration of it. The idea of a list of 1001 books you must read before you die is throwing me into some kind of existential crisis. LOL Jane, you are younger then I am so you have more time to deal with the absurdity of it! Does it leave any time for the books you don’t have to, but want to, read? Oh heavens yes, I don’t take much notice of it really, except to help me choose which ones of a famous author’s books to choose, and sometimes to discover a new one. Thanks for your review. I too read Camus long ago and you leave me ready to read him again. Thanks, Marilyn, it’s good to revisit the ones we loved, though it doesn’t help with getting the TBR pile down! I can’t find this Camus/Brannaugh audio file/CD anywhere. Must have! Where’d you get it? At my library Brian. I have no idea where else it might be available, it’s a shame. Which Sartre did you read? I am intrigued by him but don’t know where to start. BTW I must tell you because you are Queen of Haiku *smile* I am teaching Year 4 students to write haiku and having a lovely time. At the moment they are writing haiku about our unique Australian animals and some of them are very excited about this form of poetry because they don’t have to worry about rhyme. I love it when kids are excited about writing!